On Sunday I cycled my furthest distance yet- 53 miles from Victoria Park in East London to Priory Park in Southend, Essex. One of our instructors at Cycle Rhythm had suggested putting together a team of riders from the studio to take on the event organised by the British Heart Foundation. It was great motivation for our members to take their indoor training out onto the roads and challenge themselves to a long-distance cycle. We wanted to set off early as the course can get quite congested with riders. Meeting at Victoria Park at 6:50am, the weather was miserable and overcast. It was predicted to rain heavily all morning, so I anticipated a long wet slog to Southend. Thankfully the rain soon cleared and we had beautiful sunshine for the entire ride. The hot weather caught me off guard, so I’ve got some dodgy tan lines! We had a real mixture of abilities in the group, so the faster riders shot off as soon as we left the park. I rode most of the route with our instructor Sam, and two of our members Les and Phil. We aimed to finish in 3 hours 30 minutes, Phil kept pushing the pace to make sure we were on target. Heading out of London, I got caught at almost every red light which made for slow progress. The course soon became the country lanes, so we could pick up a little speed and enjoy the familiar Essex cycling routes. I was soon sweating in my jacket, so stopped to take it off and shove it in my back jersey pocket. We went slightly off course in the village of Stock. The right-hand turn was not very well sign-posted so we carried on straight along with lots of other cyclists. We soon realised our mistake and turned back towards the junction. 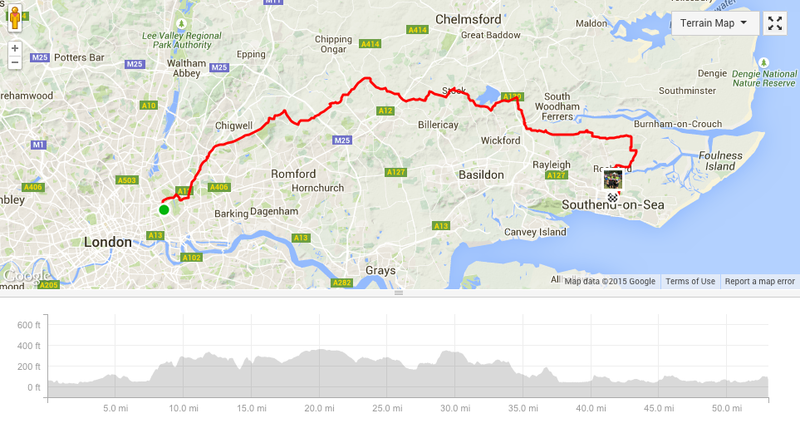 The route was advertised as 52 miles, so I think that is where the extra mile came from- my Garmin measured it as 53. I felt good throughout the ride, it was lovely cycling in the sunshine chatting to the others about the studio. There were lots of refreshment stops along the route, but we didn’t stop at any of them. We kept pushing on towards Southend and I ate a few Shot Bloks as I cycled. The miles flew past and I soon realised we were over half way. I came very close to being hit by a car which was incredibly scary… at Battlesbridge, we crossed two busy roundabouts and the driver turning off didn’t see me. I rode up onto the pavement and narrowly avoided the car. I was a bit shaken up, but carried on to catch up with Sam, Phil and Les. There was an option of taking an additional loop which added 13 miles to the route, but we decided to stick with the original plan and go straight to the finish line. The last 6 miles into Southend were congested with traffic and a strong headwind had picked up. I got stuck behind a horse and cart on the narrow roads, so again went up on the pavement to get ahead of the congestion. I watched the last few miles tick over on my Garmin- it seemed to take forever to reach the park where we would finish, but finally we saw the narrow entrance. We finished in 3:41, a little slower than we hoped but it gives us a goal for next year! Arriving at Southend, I caught up with my friends from Havering Tri, plus local cycling clubs Romford CC and Hornchurch CC. There was a huge turnout from the three clubs and it was great to see Priory Park full of our club colours. Glen had finished the ride in 2:48 and was waiting for me at the finish line along with the other speedy Cycle Rhythm riders. There was a great atmosphere in the park as it gradually became more crowded with cyclists and supporters.